September is Childhood Cancer Awareness month. Did you know that? 2 years ago…I didn’t. In honor of all of the kiddos affected by this terrible disease, Sophie The Brave is going Gold. I’ll be posting daily on the Facebook page in an effort to gain as much awareness as possible! To start, last night I spoke at Go Gold 2018 our local Childhood Cancer Awareness month kick off. First of all, I’d like to say thank you to Gold Network for constantly pouring into this community of cancer families. Thank you Heather & Josh for listening to the Lord’s calling on your lives to make a difference even when you were in the midst of Sawyer’s fight. I love you both so much. September, used to be just another month for me. Labor Day meant a day off after the first two weeks of school. My sister and my dad’s birthdays are in September. It meant college football season and hopefully cooler temperatures. Then, my world got really big, really fast and I found out what September really is. 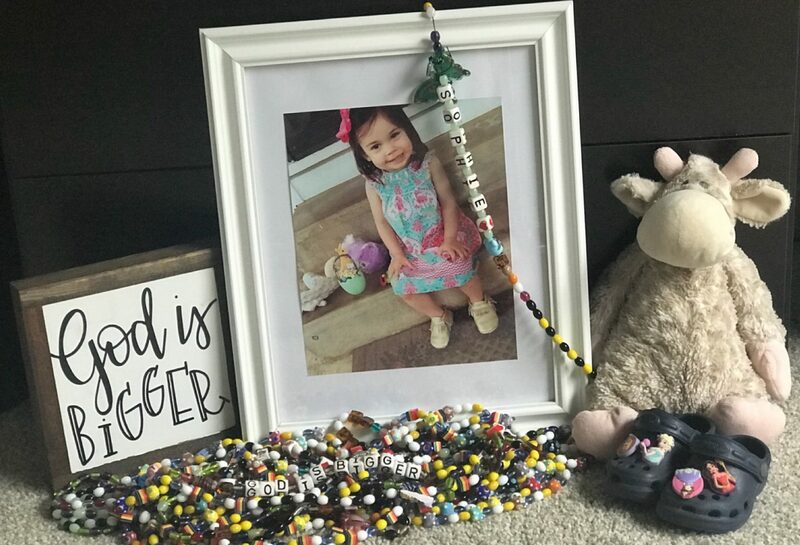 My daughter, Sophie turned 2 on March 19, 2017 and two months later on May 18th she was rushed to Children’s in Dallas with a tumor the size of a softball in her chest pressing on her right lung, her airway, and her heart. We heard the words mass, tumor, oncology, ICU, cardio, oxygen, neutrophils, chemo, steroids…and so many others that I never in my life imagined hearing. One week later we had a diagnosis, stage 4 Lymphoblastic Lymphoma. I could stand here all night and tell you about her fight and how incredibly brave and amazing she was but, you all need to get home at some point. We fought this aggressive tumor with a vengeance and every 1% complication that could happen, did. Fever, fungal work ups,infected diaper rashes, months in the hospital, relapse, ICU, breathing tubes, adult grade chemo, catastrophic brain damage, complete disability from chemo…..and finally a second relapse and then she was gone. January 4th of this year was the day I held my fuzzy headed baby for the last time. Again, I could go on about all of that another time but tonight, tonight is about the fight for awareness and research so that no one else has to do what we had to do. When Sophie was diagnosed, our world got so much bigger. We entered the world of IV pole tetris in the playroom, face masks, puke bags, therapy dogs, nerf gun wars with nurses, isolation, fear and great hope. The world where nurses are family and doctors become your best friends. You learn every name of the people at the check in desk and you have a ‘regular’ in the cafeteria. We realized that childhood cancer is not just cute, smiling bald kids on St. Jude’s Commercials. While they are cute and bald….and they do smile way more than you’d expect. That’s far from all there is. It’s incredible to watch a child fight cancer. Any of the families here will tell you it’s the most terrifying experience of your life but also, it’s the most incredible. We see our kids battle things grown men would faint at.The resilience of these kids is astounding. But as incredible as they are….they shouldn’t HAVE to be. Sophie’s fight and death have inspired a great desire to keep other kids from this monster. That’s what September is to me now. A chance to spread her story and the story of so many others to as many people as possible-To shine light on the lack of funding for new treatments, the lack of long term support as these kids grow and deal with lifelong side effects from the outdated ADULT chemo they recieve. September is a chance to show that COMMUNITY, LOVE, and MASSIVE AMOUNTS OF PRAYER are the only way to get a family through this. So tonight is in fact to honor these incredible kiddos that are here tonight, the kids that are fighting in the hospital currently, and those that we have lost like Sophie, Brock, Kaylynn, Audri, Riley, Luke….and thousands others. But it’s also for everyone else. The friends and family. The church members. The community. Stand up and fight with us. Go Gold in September and the other 11 months of the year. Because Kids can’t fight cancer alone….and neither can their parents. I’d like to quickly finish by reading something that I came across recently written by a cancer mom named Carol Baan in 2003. I hope you never have to prepare your child to undergo radiation or chemotherapy, have a port surgically inserted into their chest, be connected to IV poles. Thank you so much for being here and for supporting Gold Network. I hope you’ll Go Gold with us all month long.